> Is the Sunshine State Becoming the Wildfire State? For many, Florida is known for its warm, sunny weather, sandy beaches and crystal clear waters. For insurers, Florida is known for sinkholes, tornadoes, wildfires and of course, hurricanes. People do not often associate the Sunshine State with wildfire, but Florida has had severe wildfire activity in the past and current conditions present severe potential for future activity. The most common causes of wildfires are arson, burning debris that "escapes," and lightning. Wildfires have become a serious threat, not only to homeowners but also to the general population; they affect air quality, visibility on major roadways, and the state's resources for fighting them. Florida’s current trend of warmer and drier conditions presents an elevated risk of wildfire, which is a source of concern for homeowners, business owners and insurance companies alike. Florida has a number of unique factors impacting wildfire activity - specifically, localized hurricane-force winds and the availability of highly susceptible vegetative fuels. The availability of these fuels combined with 40-60 mph winds create the perfect conditions for wildfire conflagration.4 Furthermore, flying embers can travel up to a mile (or more) from a wildfire and are one of the leading causes of structural damage. Unlike hurricane season, wildfire season in Florida is considered to be 12 months long. Peak season for Florida wildfire typically begins in January and continues until the start of hurricane season. 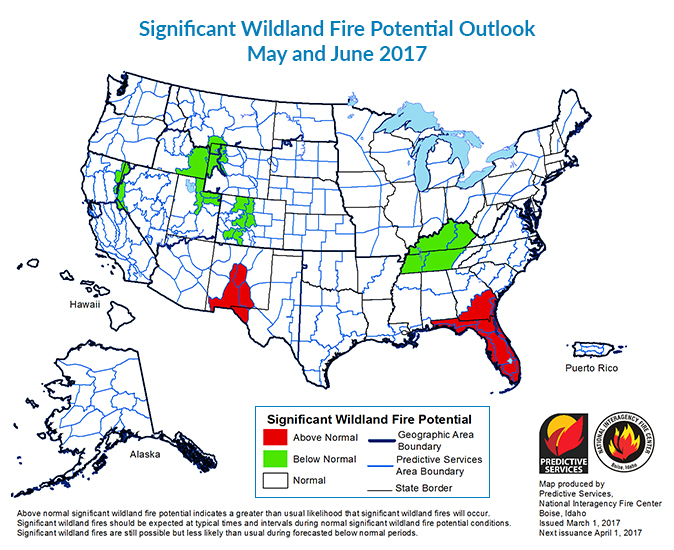 According to the National Significant Wildland Fire Potential outlook, the highest likelihood for above normal, significant wildfire potential in the Southeast will be in Florida and Georgia. In addition to drier and warmer weather conditions fueling the above normal wildfire potential, the growing number of people living in new communities built in areas that were once wildland is also cause for concern. 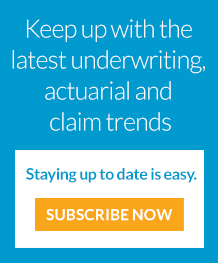 People are not only moving to areas along Florida’s coastline, but also to the interior sections of the state, thereby creating a potential shift in migration areas and potentially changing the risk profiles for many Florida insurance writers. A series of studies examining how Florida will grow and develop by 2060 concluded that by that year more than 7 million acres of additional lands will be converted to urban uses.8 As more people flock to Florida, the expansion of human development into or near land prone to wildfire will be dramatic - increasing the number and dollar value of exposed risks. Educating developers and homeowners on proper mitigation techniques to reduce wildfire potential will be imperative in order to reduce loss severity as property developments continue to be built in areas that were once wildland. My colleague, Chris Beston, published an underwriting checklist of things to look for when evaluating a location, as well as some key tools and resources for underwriters to consider. 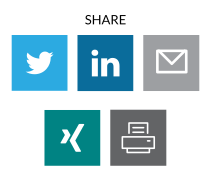 On a portfolio basis, exposures can change over time; therefore, it is important for insurers to continually monitor their book of business and manage geographic concentrations of risk. Insurers who actively manage their territory mix will be able to reduce exposures in high hazard areas and redeploy their capital in other areas that meet target loss ratios. Insurers need to demonstrate strong book management skills for natural catastrophe exposures and for the peril of fire. Gen Re’s analytical tools enable insurers to optimize their portfolios and monitor both accumulations and density concentrations. Additionally, we have also launched a new platform to display non-catastrophe-related fire severity specific analytics. Insurers who take a proactive approach in addressing wildfire risk through underwriting, exposure management and risk mitigation techniques will be able to reduce the severity exposures imbedded in their portfolio, maintain stable results and produce profitable underwriting results. “Wildfire Awareness,” Florida Division of Emergency Management. January 2017. “Natural Hazard Risk Summary & Analysis,” CoreLogic. January 2017. “National Significant Wildland Fire Potential Outlook.” Predictive Services National Interagency Fire Center. February 2017. “Florida Department of Agriculture and Consumer Services.” Keetch-Byram Drought Index. February 2017. William H. Frey, “Sun Belt migration reviving, new census data show,” Brookings. January 2016. “Florida 2060.” 1000 Friends of Florida. 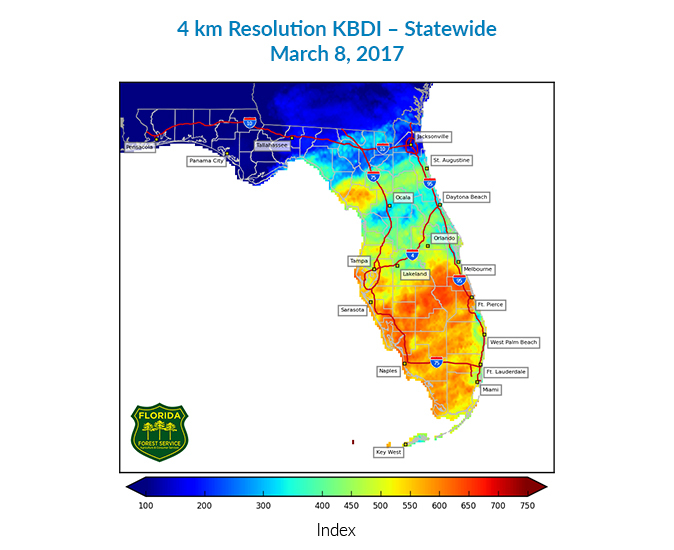 Home > Knowledge > Blog > Is the Sunshine State Becoming the Wildfire State?